Clearly, I’ve been playing a lot of Ocarina of Time. But hey, as long as it’s fresh in people’s minds thanks to the remake, I might as well throw down some Zelda comics! This strip went through a couple revisions. The first several panels and central concept remained the same–we assume Skulltula Guy used to be a regular-looking human, when that may have not been the case. The original punchline had him revert to being a human, but a monstrously ugly one, one that looked almost exactly like the spider in panel 1. But I thought this didn’t make it clear enough to the reader that he was ALWAYS like that, rather than the curse having an effect on him. Then I came up with the idea of him always being a realistic giant spider, implying the curse actually made him MORE human. Anyway, I’m not sure why I settled on the current punchline over the other two–they’re all essentially three versions of the same joke, told from different angles. 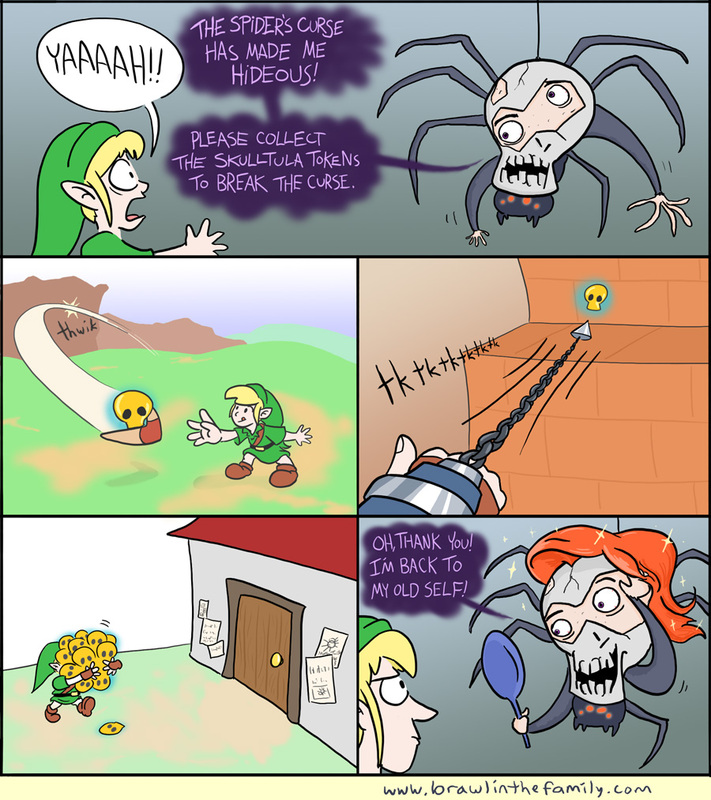 But I thought Link feeling like he wasted his time was a nice bonus for the last panel, so victory goes to the hair ending.